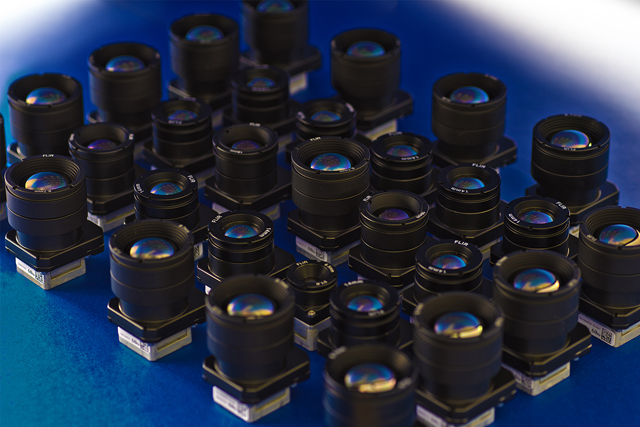 The FLIR Boson longwave infrared (LWIR) thermal camera core is a giant leap forward in thermal imaging performance, size, and price. With its embedded Movidius Myriad 2 12-core image processor, wide range of lens options, physical shutter, and FLIR's XIR™ expandable infrared video processing architecture, it allows system integrators to take their thermal applications to far greater heights. Perform on-board video analytics, drive external sensors and peripherals, and communicate over multiple standard communication interfaces such as USB 3.0 with Boson. Scene Dynamic Range: 0 °C to +140 °C (high gain); 0 °C to +500 °C (low gain). Precision mounting holes: Four tapped M16x0.35 (rear cover). Lens support recommended when lens mass exceeds core mass. Your Boson may look different than pictured. All international customers that are ordering any Thermal Imaging Camera will be required to fill out an End Use Statement document before shipment. Once you place your order we will email you with the document within three business days. We can ship 60 Hz cameras to certain other countries (listed below) but it will require some additional documents before shipment. If you are in one of the countries below and would like a 60Hz camera email contact@groupgets.com with your order number**. Otherwise all international orders will receive a 9Hz camera. The authorized export, reexport and transfer countries for 60Hz cameras are: Argentina, Australia, Austria, Belgium, Bulgaria, Canada, Croatia, Czech Republic, Denmark, Estonia, Finland, France, Germany, Greece, Hungary, Iceland, Ireland, Italy, Japan, Lativa, Lithuania, Luxembourg, Netherlands, New Zealand, Norway, Poland, Portugal, Romania, Slovakia, Slovenia, South Korea, Spain, Sweden, Switzerland, Turkey, the United Kingdom. To offer high-grade thermal imaging camera's at a more affordable price. I have just created the GroupGet for FLIR Boson!